Internet Explorer 9 user interface is a mystery even though many technical previews of the browser were released by Microsoft. All the technical previews released so far were look less and they are mainly to demonstrate it’s HTML 5 and java script capabilities and performance. 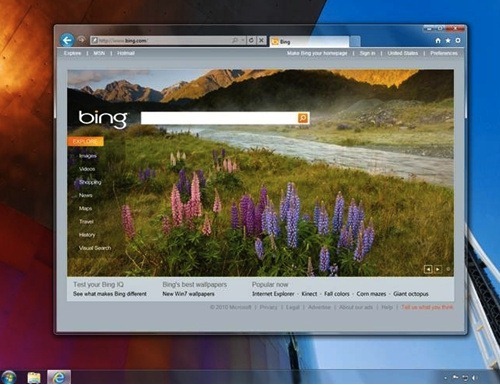 Microsoft wants to keep the IE 9 user interface design as a secret till next month’s beta launch program. But ZDNet’s Mary-Jo Foley seems to be snatched a picture from Microsoft Russia website that shows up IE 9 user interface. Microsoft reportedly deleted this photo from the web site. If this is the real user interface of Internet Explorer, then thanks to Microsoft for making efforts to bring IE back on track and trying to competing with Firefox and Chrome. For more information and analysis of the new IE 9 user interface read ZDNet’s blog post.